You’ve probably read countless articles that tell you to eat more fruits and vegetables. You likely know you should be getting between three and six cups of these nutritious foods each day, and you’ve probably been told all the amazing benefits of a diet that’s rich in fruits and vegetables. But squeezing in all your required servings can be a little tough or even just plain boring. So to help you meet your daily three to six, I have four easy ideas for fitting more fruits and vegetables into your diet. But first, what’s so great about fruits and veggies? For starters, they are an extremely efficient source of calories. They pack all kinds of nutrition—vitamins, minerals, antioxidants, and fiber—into a very limited number of calories. If you eat a wide variety of fruits and veggies, you’ll be getting nearly every nutrient you need to have a healthy, functional body without taking in excess calories—in fact, as you may well know, these foods are the kind that contain good calories that can help you lose weight; they aren’t filled with glucose and other additives that can cause weight gain and metabolic problems. Other added benefits are lowered cholesterol and a reduced risk for health conditions like heart disease, stroke, hypertension, diabetes, and certain cancers. Be sure to get a wide variety of them in your diet, however, because they all have different nutrients. So, there’s absolutely no denying that fruits and vegetables are an essential part of a healthy diet, but even though you’re well aware of this, sometimes it can be difficult to find ways to fit in all your servings. For many of us, we need some variety to be motivated to keep eating healthy; nobody wants to eat an iceberg lettuce and tomato salad every day. Luckily, fruits and vegetables are extremely versatile and can be added to almost any dish or consumed on their own. They certainly can serve as a healthy, tasty substitute for any unhealthy option. Using fruits and vegetables is a great way to add exciting flavor, nutrition, and color to any snack or meal—you just have to be creative sometimes. Thinking outside of the box can create some great recipes to add fresh twists on some of your favorite meals that tend to get a little boring over time. For example, if you don’t like the taste of pears on their own, you might enjoy them in a salad. Adding some blue cheese, walnuts, and pear slices to a spinach salad can create an interesting, fresh experience to spice up a regular salad and allow you to taste something in a new light! Still not a fan? Try a splash of balsamic vinegar and olive oil; they can help mask the flavor without taking away from the nutritional value of the pear slices. But that’s just the beginning of what you can do to add some variety to your healthy diet. Here are four other easy ways to add more fruits and vegetables to your diet. Grilled vegetables are a great way to add some flavor, color, and nutrition to some of your go-to dishes. Instead of grilling some steaks and potatoes, why not slice the steaks into strips and make skewers with green peppers, onions, and red peppers instead. Another creative option for shish kebabs may be pork, apples with a dash of cinnamon, and sweet onions. When it comes to making skewers, the possibilities are endless; you can pair nearly any fruits and vegetables with any meat, including chicken, beef, or seafood. Sometimes I even like to add some pineapple on my skewers for some sweetness. Try different options to see what works for you! I know it can be easy to think of salads in a couple of standard ways: spinach, garden, Greek, or Caesar. But the reality is that there are no limits to what can be in a salad, so taking a few minutes to get creative (or even make a Google search) can lead to all kinds of great new recipes. The truth is that salad doesn’t even need lettuce or spinach; you can simply chop up some vegetables and toss them together! Even simple meals like casseroles and sandwiches can be taken up a few notches with the addition of new fruits and vegetables. Try adding mushrooms, onions, peas, artichokes, tomatoes, olives, or peppers to your pasta or casserole dishes. You can also add veggies or fruit to any sandwich. For example, mixing up some avocado with tuna is an easy and tasty way to include more fruit in your diet. In fact, you can simply sub out your mayonnaise for avocado slices or guacamole. Being the middle of winter, if you’re like me, you likely crave a lot of warm dishes and what’s better on a chilly winter day than a bowl of homemade soup or stew. 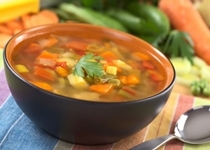 For soups and stews, simply throw some broth in a pot with as many chopped vegetables as you’d like. Cabbage, carrots, peas, corn, tomatoes, onions—the possibilities here are certainly endless. Fruits may not be such a great addition to all soups and stews, but pineapple chunks can be make for a great Hawaiian chili or bean soup! Find a Way to Boost Your Fruit and Veggie Intake; You’ll Be Glad You Did! Eating lots of fruits and vegetables is essential if you’re looking to improve your diet. There are so many ways to add them if you just think outside of the box. They can enhance the flavor, texture, and nutrition of virtually any and every meal, so don’t be afraid to get creative. Bonus Tip: One easy way to add some variety to your fruits and vegetables is to simply buy something you normally wouldn’t each time you stop by the grocery store and feature that ingredient in different meals throughout the week. “Vegetables and Fruits,” Harvard School of Public Health web site; http://www.hsph.harvard.edu/nutritionsource/what-should-you-eat/vegetables-and-fruits/, last accessed December 29, 2014.